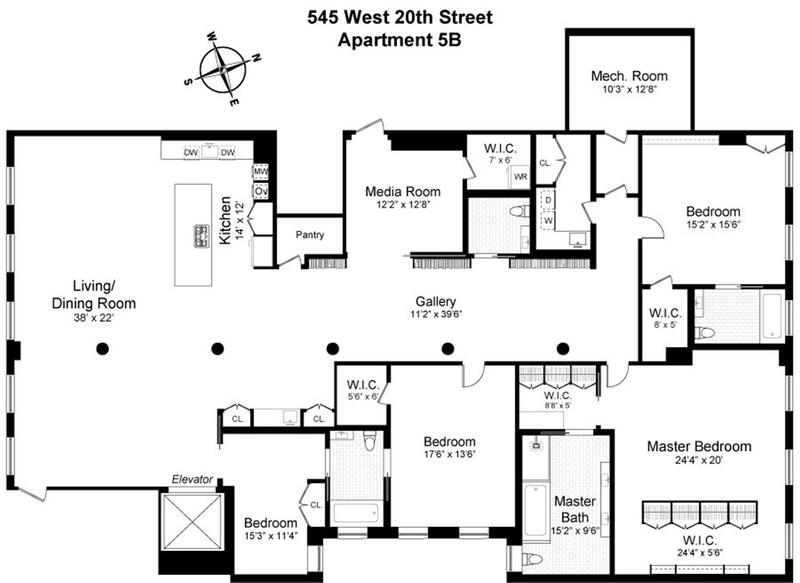 Located in the historically distinguished Lifesaver Lofts building, this sprawling four bedroom, three and half bathroom loft is situated in the heart of West Chelsea, amongst the worlds premier art galleries, which provide abundant inspiration for art to hang on the lofts expansive wall space. In the ocean of new construction in West Chelsea, it is rare to find a true historic loft stretching over 4,000 square feet. As the elevator doors open directly into the home, its scale unfolds immediately. Complete with a stunning custom walnut and steel library and gallery space, a media room with surround sound, cork walls and a walnut ceiling, three large bedrooms, and a home office which is easily converted into a fourth bedroom, this loft is flooded with light coming from windows located on the north, south and east sides of the apartment. The expansive master bedroom suite features two dressing rooms with custom cabinetry, generous floor-to-ceiling storage, and a spa-like bathroom with double Boffi vanity, soaking tub, and separate shower. The sizable second bedroom has an en suite bath, and the third and fourth bedrooms share a Jack-and-Jill bathroom.The open chefs kitchen boasts a Gaggeneau gas cooktop and three ovens, Sub-Zero refrigerator, two Miele dishwashers, and a built-in Miele coffee maker. Marble countertops, Heath tile backsplashes, custom cabinetry, and a separate wet bar make this remarkable space open and inviting.All baths are equipped with radiant heat and Boffi vanities. The lofts iron columns, exposed brick, and ebony stained wood floors date back to the original occupant, Lifesaver Candy, circa 1913. Other unique features include custom wallpaper by Flavor Paper in Brooklyn, custom drapery for the floor to ceiling windows, light fixtures by Alvar Aalto, and a vintage Schiolari chandelier in the dining room. Essentials such as central air, sonos system throughout, a large laundry room with sink, and a plethora of storage spaces, including an additional deeded basement storage, add functionality to this outstanding living space. Every aspect of this idyllic home is perfectly curated for everyday life, as well as for graciously entertaining dozens of guests.This luxurious loft occupies one of only ten others, spread over seven floors, in a notably private, secure pre-war part-time doorman condominium built in the early 1900s. The West Chelsea location is at the apex of the Citys cultural scene and in the heart of the Chelsea Art District, only a short distance from the Highline, the Hudson River Park, Chelsea Market, Chelsea Piers, Meatpacking District, Whitney Museum, and the new state-of-the-art Hudson Yards complex.